Friction Fit or Hinged – Choose Your Plastic Box Type Wisely! Rigid plastic boxes come in many different shapes and sizes, ranging from compartment boxes to rounded types, to even heart shaped styles for special purposes. But, when it comes to all varieties of plastic boxes, there are two predominant styles related to how they open and close: one is with hinges and the other, without hinges—also known as friction fit. Hinged boxes are similar to a door in terms of the open and close mechanism. The hinge is either added to the box following or during the molding process, and it helps ensure that the lid and box are always connected. Conversely, friction fit boxes consist of top lids that can be fully removed from the box. While a hinged box isn’t necessarily better than a friction fit one—and vice-versa—there are certain instances where it would be more suitable for you to have either of the two for your application. Let’s take a closer look at some of these instances, as well as the pros and cons of each style. Hinged boxes are ideal for either storing important valuables (i.e. beads, candy, nuts, bolts, and other hardware) that you don’t want misplaced. The hinged box design ensures that the lid is always connected to the box, so items that are stored in these boxes are less likely to sustain damage from outside factors since the lid is secured and more likely to be in a closed position when not in use. Some hinged boxes also permit users the opportunity to secure them with small locks, which help to further safeguard stored items. Another big benefit to hinged boxes is not having to fumble with the lid in order to remove or secure it. With the hinged design, it literally just flips onto the compartment of the box to close. It’s easier and more convenient to use. In the case of friction fit boxes, the top and main box portion are separate, so each box consists of two pieces—not a single “entity,” as is the case with the hinged box. Friction fit boxes are ideal for just about every type of application, although they typically don’t offer the security that hinged boxes can for more valuable items. Because the top and main compartment separate, another disadvantage is that matching pieces can be lost or misplaced over time. However, there are a few notable advantages worth mentioning about this style. Because they don’t include a hinge, these boxes are usually more compact and easier to stack and organize – a helpful attribute when it comes to storing these boxes. 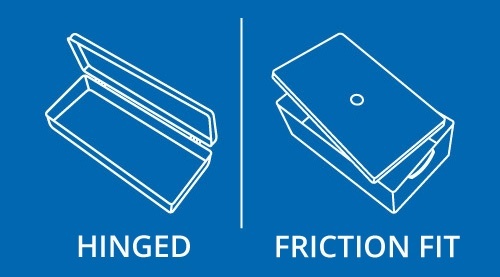 Friction fit boxes are available in a wider variety of shapes and sizes, compared to their hinged counterparts, because the hinge doesn’t need to be accounted for in the design. Many consumers prefer the “sleeker” friction fit look, as some see the presence of hinges as unsightly. Alpha Rho manufactures a wide assortment of stock and custom clear polystyrene lid and hinged plastic boxes for food handling, packaging, and storage applications. Do you know what kind of rigid plastic box is best suited for your needs? Take a look at all the options we have to offer. ← How Is General Purpose Polystyrene (GPPS) Different from High Impact Polystyrene (HIPS)?